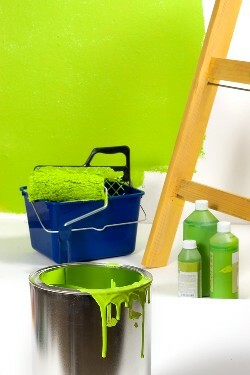 Why Switch To Eco Friendly Paint? Being environmentally conscious when selecting paint and paint related products isn't just important for the environment. They can have a huge impact on your health as well! A 2002 study by the United States National Cancer Institute found that people working as painters had a significantly increased risk of cancer, due to the VOC (volatile organic compounds) levels found in some paint products. VOC's are potentially carcinogenic, carbon-based chemicals found in conventional paints that are released into the air when new paint is put on, old paint is removed, and to a lesser extent, continually throughout the life of the paint job. Common VOC's include formaldehyde, pesticides and cleaning chemicals. VOC's evaporate slowly at room temperature. While they outgas (a process that can take weeks) they may cause health problems such as dizziness, irritation of the eyes and trachea, lung, heart, kidney damage or cancer. VOC's are most concentrated indoors, but they can affect outdoor air quality as well, so using an Eco Friendly exterior paint is also important! According to the California Air Resources board, more than 66% of the 176 million pounds of VOC emissions generated annually in California come from paints and other surface coatings. Oil based paints often contain more VOC's than water-based paints, usually making up 60% of the content of the paint products. Early on in the development of paints without VOC's, many natural paints had a tendency to fade and this created a difficult to wash surface. Eco Friendly paint colours were limited and often washed-out earning them a negative reputation. Today, paints with little or no chemical outgassing come in a wide range of textures and finishes, and an unlimited range of colours to meet any painting need. Contemporary, low VOC, Eco Friendly interior paint is created with a water base, rather than traditional petroleum based solvents. According to the regulations of the Environmental Protection Agency, low VOC materials must have less than 200 grams of volatile compound per liter of paint, or 300 grams per liter of varnish, as typical conventional paints have more than twice that amount. All Supercoat Paints have VOC levels of 45 grams per litre or below. When using Supercoat products it is always considered good trade practice to keep the space well ventilated when you're painting. Don't remove old paint that may contain lead yourself.. Especially NOT With a Sander! Lead paint use in homes came to an end in the late 1970's. If you are not sure, have yours tested first and if it does contain lead, you had best call a certified professional to remove it for you. If you know that it does contain lead and it is in decent shape, you may simply paint over it without scraping or sanding the lead paint. This will help seal the lead in and make it more difficult for kids to become contaminated. When you dispose of your unused paint, save it carefully, making sure there is a tight seal around the lid. Superbuild International is committed to Eco Friendly products. The Supercoat Ecoclean range of products are 100% pure Acrylic based products with very low VOC levels between 0 - 45 grams per litre.